Like many people who are diagnosed with early-onset Alzheimer’s, I really had no idea what to expect. Would I be just a shadow of my former self within a couple of years, reduced to struggle with the most menial tasks? In calmer moments, I would recall that I had been living with the symptoms of the disease as early as the spring of 2012, almost three years before I received my diagnosis. Soon after, I learned of Greg O’Brien and his book On Pluto: Inside the Mind of Alzheimer’s. For me, the book’s timing was perfect. Like O’Brien, I am a former journalist, and we both know how to tell a story. But one element of O’Brien’s story has dismayed me: his rage. At first, I thought his anger was just part of his personality, and having Alzheimer’s caused him to lose his cool more often. Growing up, I often lost my temper, a trait that descended from my grandmother and mother. Outside of my family, I rarely blew my top, but there were exceptions. Playing in a Babe Ruth League tournament in Camas, Washington, at age fifteen, not far from the Columbia River, I threw a tantrum in front of at least 100 spectators, almost all of whom were hostile to me and my team. The flashpoint came when I was at bat. The pitcher was right-handed, and his pitch was a curveball, high and inside. As I curled away reflexively, the pitch struck my shoulder. I assumed the call would be “hit by pitch.” But the hometown umpire ruled that I swung at the pitch for, strike three. Then I exploded. Before my coach could restrain me, I wheeled around and gave the hostile crowd the finger. This, of course, was a case of pouring gasoline on the fire. But that episode was singular. Once I got past my sophomore year of high school, my temper moderated. That’s not to say that these days I am a mellow personality. But major outbursts have been infrequent during the five-plus years since I first noticed a decline in my short-term memory. The first major blow-up occurred in the summer of 2014, about a year ahead of my diagnosis. I was driving to Winchester, Massachusetts, about a six-mile drive from our home in Somerville. Our destination was a swimming pond, where we had a membership. The topic of the argument, oddly, was laundry. We live in a two-unit condominium, and our downstairs neighbors share the washing machine and dryer with us in the building’s basement. We store our dirty laundry in a closet in the master bedroom. We do the laundry twice a week, Sundays and Wednesdays, and we separate the clothes into colors and whites. For the first eighteen years in our home, the process went smoothly. But then Alzheimer’s entered the equation. The result was that Paula and I had a fierce argument about laundry. I complained that Paula’s system was too complex, like something Franz Kafka might have conjured up. The real problem in the system was my cognitive decline. Our dirty laundry resides in our master bedroom’ closet, three flights above our laundry facilities. Sometimes, by the time I reach the basement, I have forgotten Paula’s directive. Take the dried clothes out the dryer? Simple enough. Use the correct amount of detergent? We only need a concentrated teaspoon. But some garments are more delicate than other garments. Dark fabrics must be separated from whites. My teenage daughter much prefers soft hand towels to stiff hand towels. A more recent blow-up took place in September 2016, when I was organizing a trip to the Northwest with my adult son. Paula and I argued about whether he and I should rent a car once we were on the ground in the Northwest. My argument was that I knew the roads and highways of my home state very well, and there is less traffic in northwest Washington. Paula’s concern was that I might damage the rental car, boosting our insurance rates. Paula and I got into a shouting match about the issue on the way to our support group meeting at the Alzheimer’s Association, and we had to pull over until I calmed down. Within a matter of weeks, after talking to my doctor, I voluntarily turned in my driving license, with no deep regrets. I hadn’t had an accident since 1984, and I wanted to keep it that way. And in the dense community I inhabit, I can do most of my errands on foot or by bicycle. Well said, Greg O’Brien. And let me thank you for serving as my Dante to your Virgil. But where do I go from here, once I myself has reached the disease’s unwelcome middle stage? There are known knowns; there are things we know we know; we also know there are unknowns; that is to say, we know there are things that we do not know. But there are also unknown unknowns—the ones we don’t know we don’t know. —Donald Rumsfeld, commenting on the run-up to the 2003 invasion of Iraq. 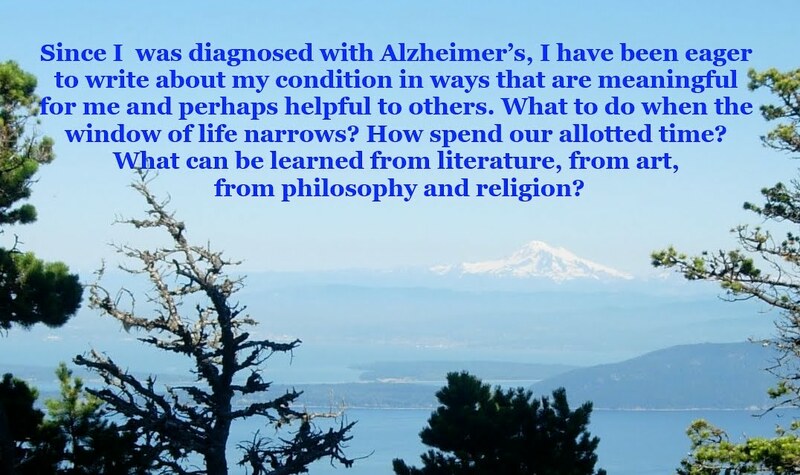 Within a couple of months after I was diagnosed with Alzheimer’s in June 2015, I had a revelation. My understanding, at that time, was at a rudimentary stage. Previously, I’d assumed that the only way I could have developed the disease was to inherit it from someone within my family tree. After examining both sides of my extended family, my Anglo side and my Croatian side, I could find no obvious culprit. Two of my four grandparents lived into their sixties, with no signs of dementia. Another died young, in a logging accident, but his parents each lived well into their nineties. My paternal grandmother, who grew up on an island in the Adriatic Sea, died in middle age, from complications of a childhood illness in an era before the advent of antibiotics. But given the link between diet and Alzheimer’s, it’s unlikely that my paternal grandmother would have been carrying the APOE4 gene, which heightens the risk of developing Alzheimer’s. The disease appears to be less common in the Mediterranean region than in northern Europe or North America. Then I had an epiphany. I recalled that I’d been knocked out for about fifteen minutes when I fell off my brother’s back bicycle fender at the age of six or seven, in an era when almost no cyclists wore helmets. But, recently, I was disabused of the notion that my single concussion could have accounted for my Alzheimer’s diagnosis. Any concussion would have to had lasted at least 30 minutes to sustain the kind of brain damage that could lead to Alzheimer’s directly, many decades later. And, recently, my mom confirmed that I was unconscious for only about fifteen minutes. What that concussion probably did do to me was to leave me with a permanent poor sense of direction, but no more dire consequences. A more plausible thesis, though, is that “subconcussions,” a relatively new understood phenomenon among head trauma, could have accounted for my dementia. In the 1970s, when I was playing football, coaches often sanctioned “live” hitting during practices almost every day of practice. And I might have been particularly vulnerable because of my small stature (five-foot-seven, 135 pounds, as a high school sophomore). By the time I was a senior I had largely matured physically, but perhaps the damage had already been done. Recently, I reached out to Shannon Conneely of the Boston University’s BU CTE Center, to see if my appropriate diagnosis could be CTE—short for chronic traumatic encephalopathy. First, Conneelly noted, CTE’s symptoms tend to appear in one’s late forties, and early-onset Alzheimer’s (my diagnosis) typically begins in one’s fifties or later. The most stark difference between the two diagnoses is that people with CTE are much more likely to have weak impulse control and poor judgment, which can lead to aggression, and, in some cases, suicide. If I had to speculate on how I ended up with early-onset Alzheimer’s, I would go with this: Being on the small size, even in high school, I compensated with over-the-top aggressiveness. I knew how to bring bigger players down by chopping them down at the knees. And I sometimes “saw stars” when I hit heads with another player, producing a sparkler effect at the margins of my vision. Decades later, soon after I was diagnosed with Alzheimer’s, I was contacted by my former football teammate Steve DeWitt, who was one year ahead of me in high school. Like me, Steve had no known family history of Alzheimer’s. At the time, it seemed obvious that my diagnosis was the result of high school football. Roughly 40 years after we’d had any contact between the two of us, we were each diagnosed, a single year apart. The gestation periods of the disease were virtually identical, even accounting for Steve being marginally older. But my wife, Paula, offered another suggestion. She suggested, sometimes in the realm of Alzheimer’s, things just happen, with no obvious cause of the disease. That could be the case. Still, if I were betting, I’d bet on head trauma, in the form of subconcussions. When Steve and I were playing football in the 1970s, no one had heard of this phenomenon. I expect to learn more about subconcussions in the years ahead. But for now I have to resign myself to the fact that there is no real way to pin down the cause of my dementia with certainty. Maybe that is for the better. My focus, after all, remains on doing whatever I can do to hinder my disease’s progress, through daily exercise, good nutrition, good sleep habits, and staying engaged mentally and socially. For now, short of a medical breakthrough, this is all we can do.